I remember this being listed as a series, but does anyone remember if the timing of the series was mentioned (monthly, quarterly, etc.)? Nope, not mentioned at all. I took the description from shopdisney before they deleted it and it's on Pin Trading Database. Just that it's part of the stunning silhouettes "collection". So, there is at least three I think, to qualify for a "collection" right? I would think so. "Collection" and not "series," eh? Maybe they aren't willing to commit to a regular release schedule. I know! It's weird that they call this a collection and not a series. Hopefully this doesn't span years!!! Snow White was just released! It wasn't mentioned and doggone it, DS released Snow White this AM! And, it's sold out. No one will cast a shadow on your dream collection with this jumbo Snow White pin from the ''Stunning Silhouettes'' series in a Limited Edition of 300. The Disney Princess is framed in a translucent red window with a golden frame. How did you even find out?? Saw a post on Facebook. Sami, pokealbis, watzshakinbacon and 1 other person like this. Sadly, I was asleep at the time (like when Belle came out). I need my sleep! Did you notice that they limited it to 1 per person now? And reduced the price down to $32.99? That's why! The only thing that would wake me would be a text, especially since I"m not on social media. If anyone is trading Snow White please take a look at my pinpics - tinawap (same as here). Thank you. I'm so sad I missed Snow White! I wonder if they will keep doing a release about every three months or totally random releases. 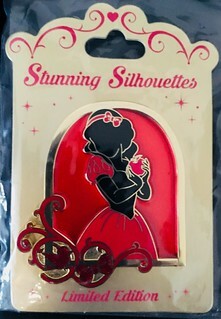 what pst time did this snow white pin come out? Sometime between midnight and 12:15 am PST. Although I am not collecting I am glad to see the series/collection is continuing and I truly hope DS.com will complete the intended series/collection. I was very lucky to get Snow this morning on the fly. I actually thanked the pin trader who posted it on their Instagram page. I missed Belle though and she’s my fav. I hope to get all in this series. I plan on checking every Monday morning. It’s truly the most beautiful pin series I’ve ever seen...CAN’T WAIT to see what Ariel and Rapunzel look like!! Looking for Belle now, want to complete this collection! Question - how did someone find that link ? I also checked the website around 5:30 the morning it was released and my search didn't bring it up. After I saw this thread I tried again and it wouldn't come up, but when I clicked on the link, it came up ! I need to be ready to score an Alice is one ever comes out. Not sure how the original person found it. I just saw someone in a facebook group post it. Received notification the pin has shipped! I bought one of these and was able to make a really awesome trade. I can't wait for more to come out!